Welcome to Part 2 of our WordPress Beginner’s Guide. Previously, we showed you how to create a WordPress Page. Today, we’re going to outline the best practices for WordPress SEO options, using the Navigator Multimedia WordPress theme, Chimera. You want to bring your WordPress site content to the right people. 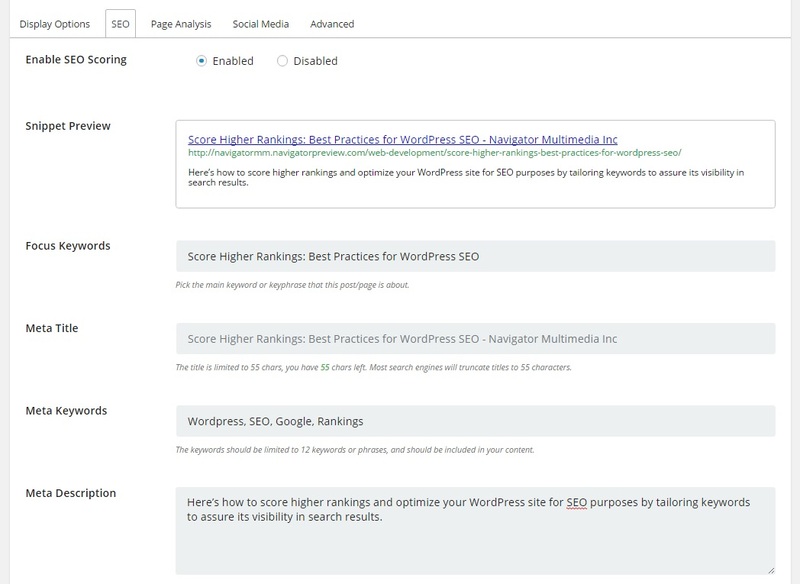 With a basic understanding of who your audience is and what they search for online, you can tailor keywords for your WordPress site to assure its visibility in search results. “Designing your site around your visitors’ needs while making sure your site is easily accessible to search engines usually produces positive results” (Search Engine Optimization Starter Guide). If every piece of content published on your WordPress site benefits your users, you’re already on the right track. Make your site accessible to search engines, and you can anticipate higher search rankings and more visitors. Permalinks for Pages and Posts are automatically rendered, based on the Title content. This is the permanent web address for this item of content. It marks a spot amongst other Pages and Posts, and so should be identifiable as such. If the content is a biography, the permalink should display the word “biography”. If the content is an article about raising cows, the permalink should reflect this. You can edit the permalink to remove “stopwords” like “a”, “the” and “and”. Stick to concise identification for each Page and Post permalink. Some WordPress themes provide SEO options for Pages and Posts, such as Chimera Framework. Others require plug-ins. Some popular, easy-to-use plug-ins include All in One SEO and Yoast SEO. Plugins often offer automatically generated SEO data based on your Page/Post content. However, you want to ensure your keywords are consistent with the Page/Post content, and fit your visitor’s needs. Take the time to tailor your own keyword-driven titles and meta data before you hit publish. The meta title “is one of the single most important factors for ranking in the search results,” says Yoast.com author Joot de Valk. Search engines put more weight on the early words, so put your keywords near the start of the page title. Include your brand at the end of the title “so people may recognize you in consecutive searches” (de Valk). Do not exceed the character size (60 for titles). The meta description is important too, because it appears as a “snippet” below the link in a search result. It should entice the user to click the link, and include the keywords from the content and the title. Do not exceed the character size (160 for meta descriptions). 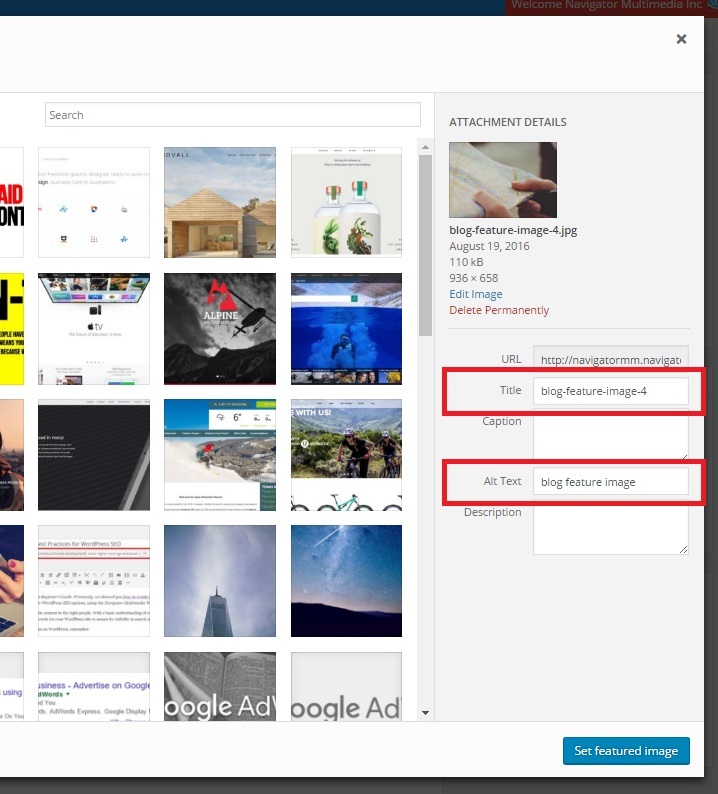 When you upload a new image to a Page/Post, optimize the title and alternate text for keywords. The Title description appears when a user scrolls over the image. The alternate text adds a bit of keyword juice for Google bots as they crawl the page and decipher the information. A WordPress blog for your small business is an effective and easy-to-use way solution for delivering valuable, fresh content to your intended audience. Like any other website, a WordPress presence should be optimized for search engine results, so that your content is readily visible on Google and Bing. With these best practices, you can score higher rankings and make the most of your valuable web content.